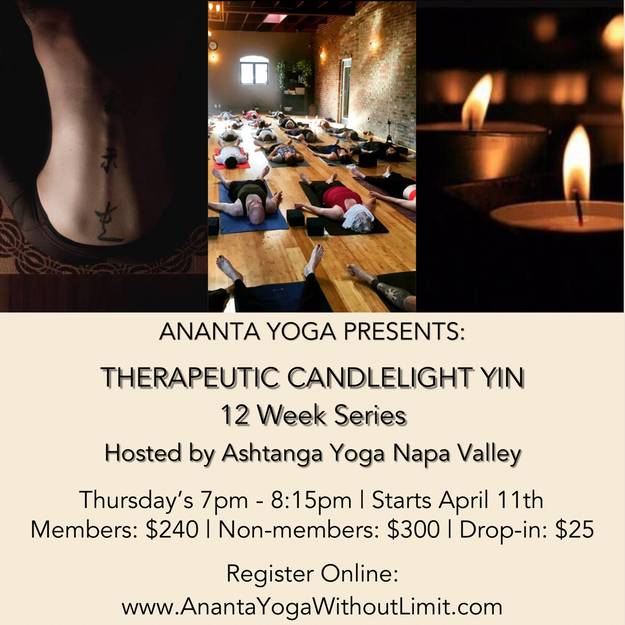 for a 12 week Therapeutic Yin Series. Looking to deepen your asana practice, initiate your body’s capacity to heal, and bring sustained peace and balance into your life? According to Taoist principles, all of creation is comprised of opposing, yet complimentary forces known as Yin and Yang. Yin represents the lunar aspects of nature: dark, dormant, cool, soft, supple, feminine, and yielding. Yang represents the solar aspects of nature: bright, active, strong, hot, fierce, masculine, and purposeful. In a world so often overstimulated and overstressed by Yang activities, we find ourselves riddled with aches, pains, stresses, and dis-ease which can lead to illness and injury. Yin yoga combines Traditional Chinese Medicine with Ayurvedic science and wisdom to nourish the Yin aspects of our being, bringing balance and harmony to the whole. Yin yoga initiates the body’s innate intelligence and capacity to heal. Yin yoga poses are held passively for longer durations as a treatment to the connective tissues of the body—tendons, fascia, and ligaments to increase circulation in the joints and improve flexibility. ANANTA’s unique Yin yoga approach utilizes the art of asana (the poses) as a skin to soul trajectory. Each yin session utilizes the practices of pranayama, meditation, and yogic philosophy infused with Thai massage, Reiki, Yoga Nidra, and ancient Marma therapy. The ANANTA Therapeutic Yin series stimulates the parasympathetic systems which are responsible for improving our state of health and wellbeing. This approach to Yin initiates an internal alchemy—cultivating inner-awareness, clarity, and peace both internally and externally; body, mind, and heart combined. Leila A. Fortier is an E-RYT® 200, RYT® 500, YACEP® certified yoga teacher and founder of ANANTA, a registered yoga school without borders. ANANTA offers teacher trainings, workshops, and retreats utilizing ANANTA’s custom developed system on the art of teaching yoga. Leila holds over 20 years of experience in the fitness industry with a multitude of certifications as a master personal trainer, instructor, and consultant. After investing over a decade studying various forms of yoga, Leila completed her 200 hr. teacher training through Blue Fire Yoga while living abroad in Okinawa, Japan where she went on to teach yoga to active duty military and their families.